Give Your Best Performance with Copper Wear! Copper Fit Knee Compression Sleeve gives you the support you need, helps increase recovery time, and prevents injury. 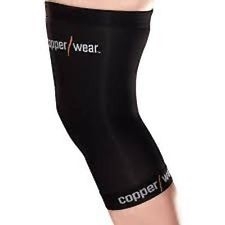 Copper Wear Knee Compression Support Sleeve provides extreme comfort and support so you can give your ultimate performance. With a high copper content Copper Wear contains 88% copper fiber embedded nylon and 12% spandex. Copper Wear fitness apparel is perfect for athletic and everyday wear to help relieve soreness and increase recovery time. The comfortable material is odor resistant and wicks away moisture. Give your best performance every time with Copper Wear. This sleeve has very strong compression so my knee feels very secure. I've been more active without pain when using Copper Wear. Very happy!